Making friends isn't always easy! 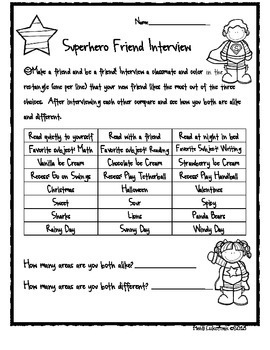 Here is a handout that you can have students partner up with and learn a little more about each other. They can compare and see how there answers are alike and different. Perfect for the first week of school. Blackline master can allow students to color in the clipart as well. Thank you Krista Wallden for Clipart and Kevinandamanda.com for fonts.